Sometimes you may find yourself deleting all your iMessages. It may be by mistake, or you only wanted to change devices. All in all, if you have backed up your messages, you can retrieve it whether on the same iDevice or another. Here we are going to take you through some simple steps on how to restore iMessages from iCloud on PC or Mac. More to that, we will also discuss how to restore iMessages to iPhone from iCloud. Hope this can give you a better experience with your iMessages. Can I Only Restore iMessages to iPhone from iCloud Backup Itself? The answer is no. If you have backed up your messages on iTunes, you could also use it as an option. Be sure that the backup you choose should contain the iMessages you deleted before. Although this process is useful, there still is a downside to restore iMessages to iPhone from iCloud backup. The biggest one to this method is that you cannot preview what iMessages data is in it. 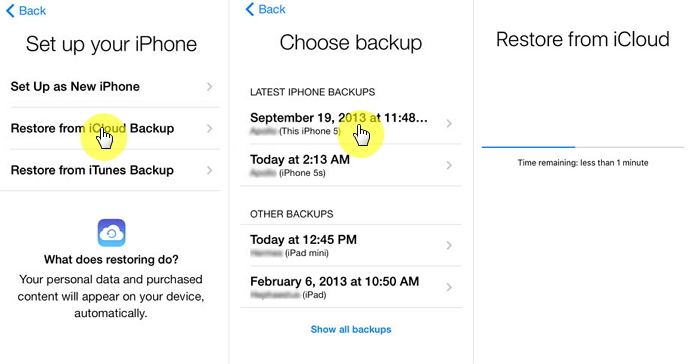 Additionally, restoring the whole iCloud backup will overwrite the current information on your iPhone. Tap on the setting icon. Then go to general. Follow through to Erase all content and settings. This step will remove all the details on your device, and hence you will have to set it up again. Restart the phone and follow the initial steps you used when you bought it until you reach the App & Data setting. Select Restore from iCloud Backup. Ensure that the iCloud backup contains all the messages you deleted. There you have it. Let your iPhone restore the backup, and you will access all your initial iMessages. Well, this is the solution to preview and then restore your iCloud backup data. If you choose to use your computer to only restore iMessages on your iPhone, you will have the chance to view what messages you need. 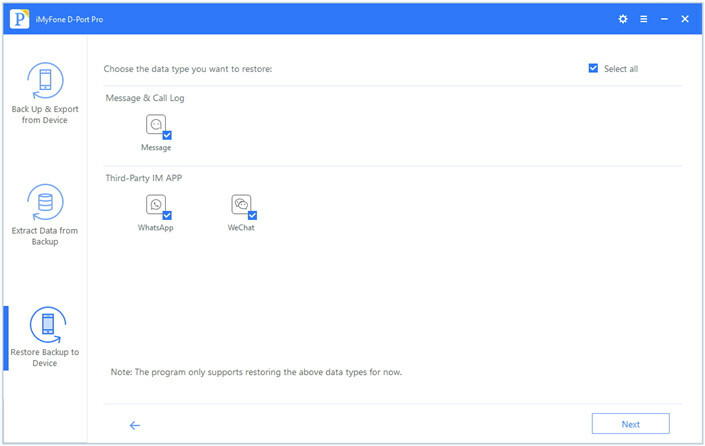 You can separately backup and restore messages, WeChat or WhatsApp. You are also able to back up data from iPhone without overwriting the previous Backup. You can restore data from iTunes/iCloud and iMyFone backup. 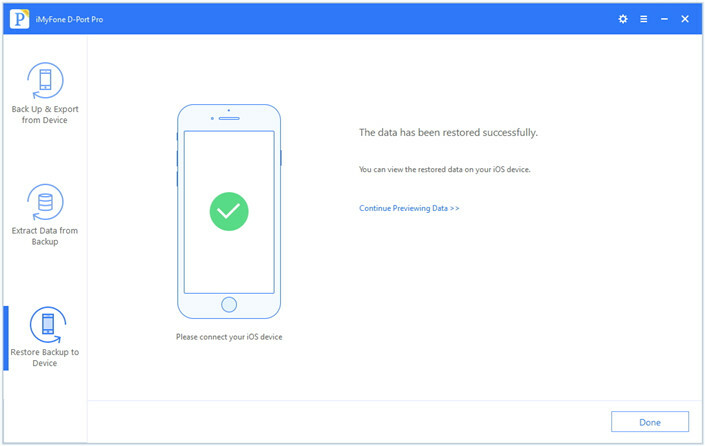 You will also be able to extract 20+ data types from back up files or iOS device. 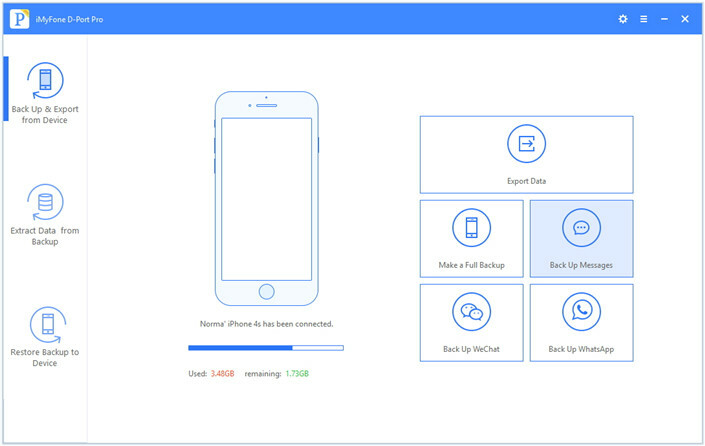 iMyFone D-Port Pro can quickly restore all your backups to your idevice. Additionally, you can also restore partial backups or certain types of data like messages to your device. 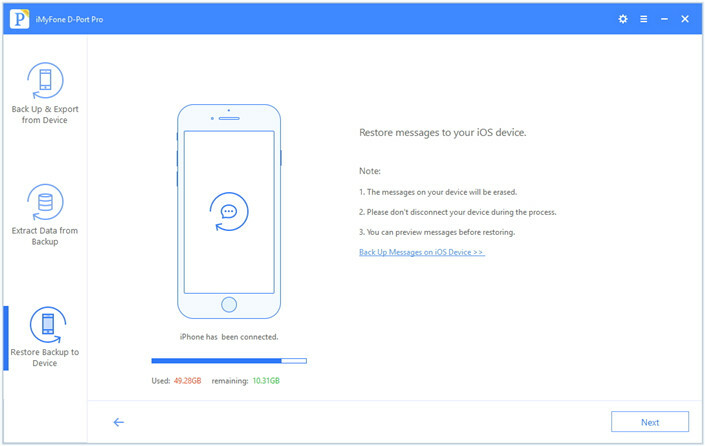 The below steps will help you restore only messages from iPhone with D-Port Pro. 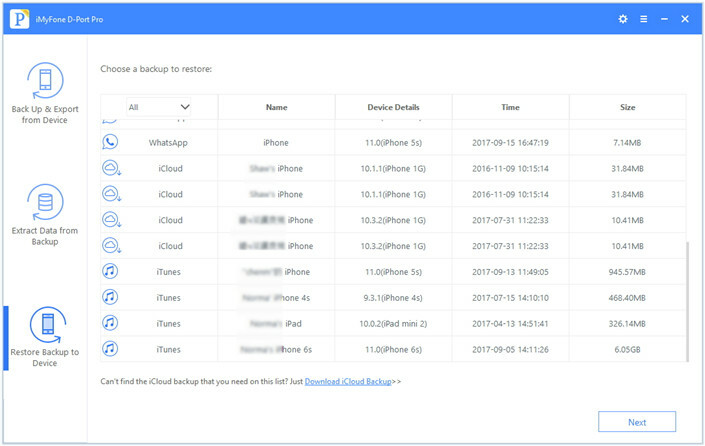 Click on restore Partial Backup after you choose one iCloud backup. Then click next. Click on messages and press next to start to scan. The scanning process will take a moment. 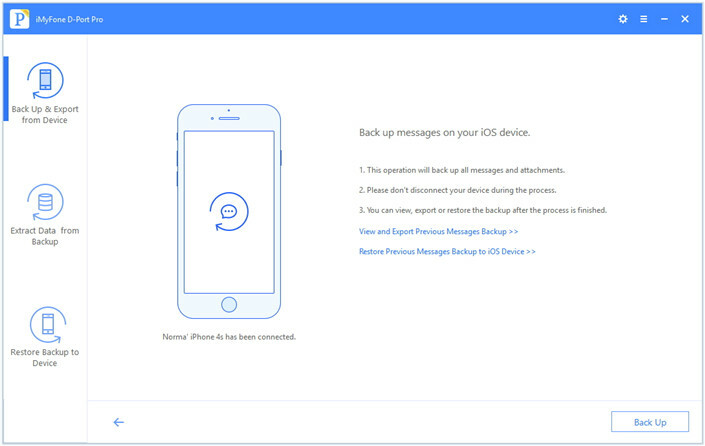 After scanning, you will get the chance to preview only your messages from that iCloud backup. Click restore hence your selected messages will be restored to your iPhone. Note: This tool is also compatible with Mac. Download the software and you can restore iMessages from iCloud Backup on Mac. Most iOS users always opt to use a Mac laptop. You may want to restore some of the iMessages using your Mac. 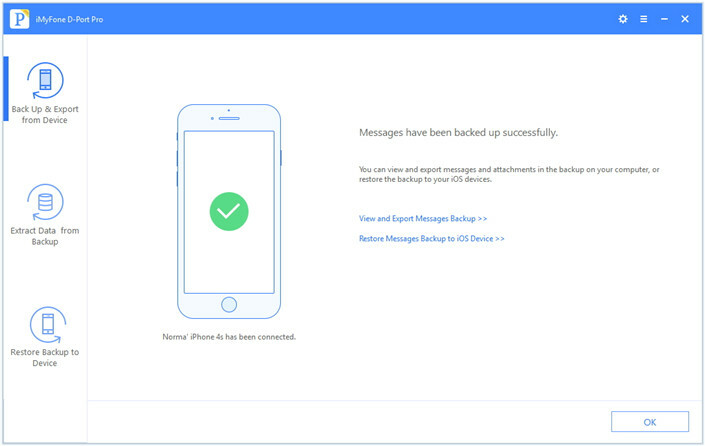 The best part is that you do not require iCloud backup to restore your messages. As an apple user, you can restore deleted iMessages on Mac from old backup files. First, you should sign out from all iMessage accounts and quit Messages. Click and hold down the option key and then select Go then Library from the Finder menu. A folder window will open then. Through this method, you can only restore entire messages but not individual conversations. Unfortunately, it will replace the current messages with an earlier version. Open this program on your computer then click on back up and export from device which is found on your left panel. Click on back up messages. Click on back up and proceed. The software will begin to back up your data. Do not disconnect your device during this process. Once the process is complete, you can view and extract the backup from your computer and restore it later. Click on restore partial backup. iMyFone will start to scan for all messages backups and display them in one list. Choose the most relevant one to start scanning. 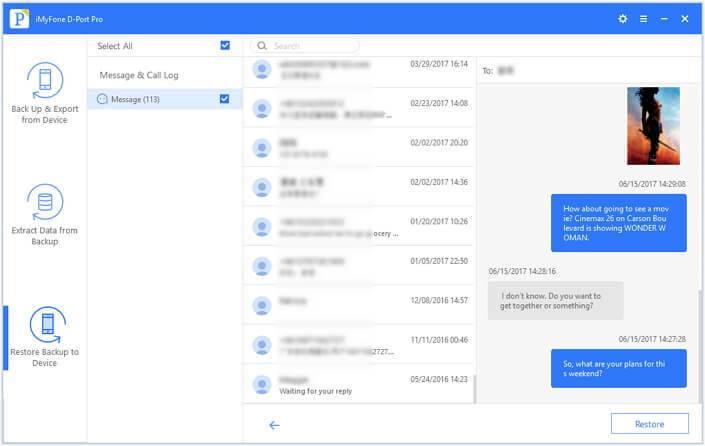 Afterwards, you will be able to preview the messages. Then click on restore, and then the program will start the restoration process. You can now view the restored messages on your phone. In conclusion, using the above steps will help you restore iMessages on your iPhone. It is clear there are different ways to restore your messages. Therefore, you need to choose one that works effectively for you. If you have any comments on the above steps, feel free to leave them below.